We are heading to Bangalore today to the home of Preethi Prabhu. Preethi is immensely creative and her Instagram feed is pure eye candy. 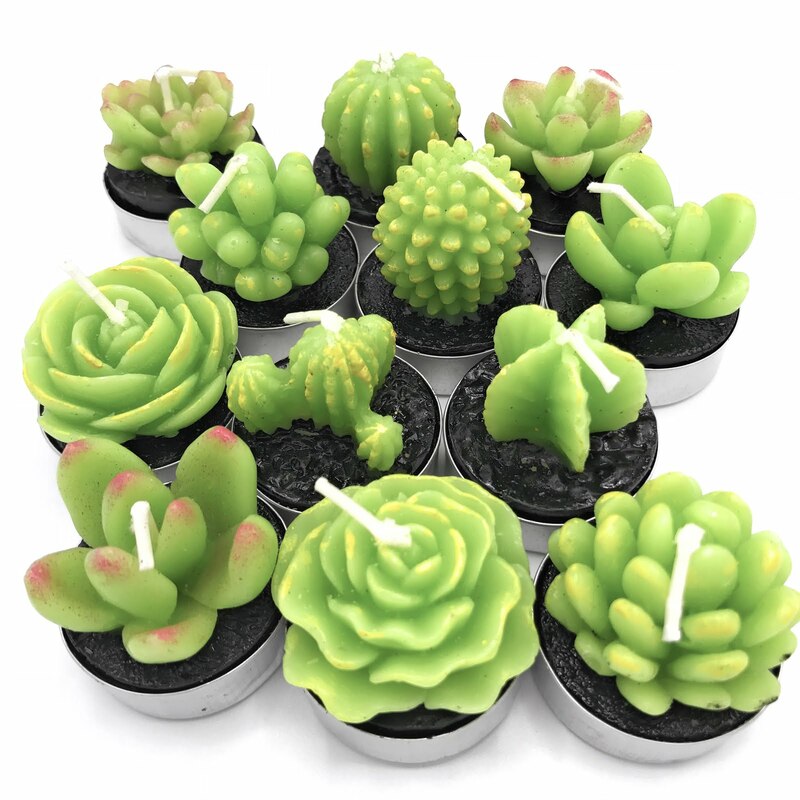 She is a keen on DIY's so you should bookmark her page for some lovely ideas and inspiration. I was blown away by this lovely wall covered with mirrors, such a fun and pretty idea to give a space bling and beauty! Thanks Preethi, I completely agree, for me too childhood memories is what I bring into the traditions and festivities in my home! Next we head on over to Dallas, Texas! 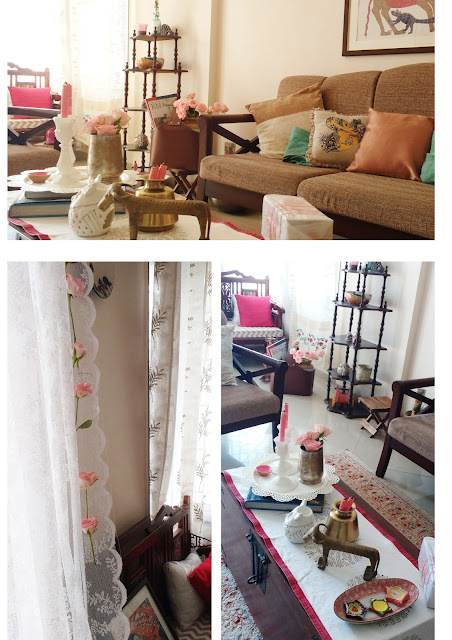 Ramya's Vijaykumar home is filled with rich eclectic and Indian accents. In Ramya's words " Diwali holds a very special place for me, when we were kids our household emphasized on going organic. But we were just kids, so had our share of fun, frolic and of course burning crackers. As teens we understood a part of being organic we shed the crackers and now as adults we see the grand meaning of going organic which is slaying the insidious evil and getting richer with the bond of blood and the spirit of togetherness. May this Diwali bring harmonious feelings and spirit of togetherness in every household "
Thanks for sharing these beautiful words Ramya and for this lovely Diwali vignette! You can find her on Instagram where she shares some lovely images of her home! Pinky's home in Toronto, Canada is a visual treat. 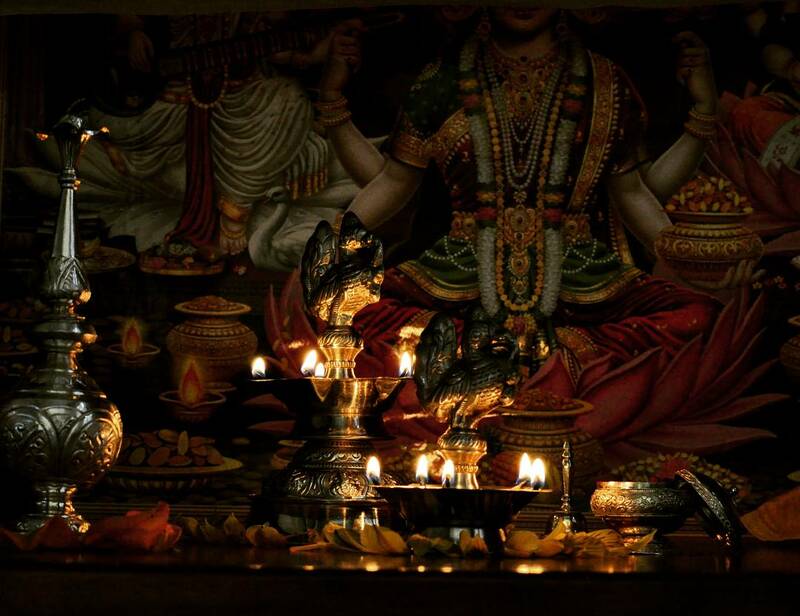 She has the most stunning brass collection of Indian brass diyas and brass artifacts. Her Instagram feed is an absolute treat. Hop on over and feast your eyes on all the pretty things in her home! In Pinky's words " Oh how I love Diwali. 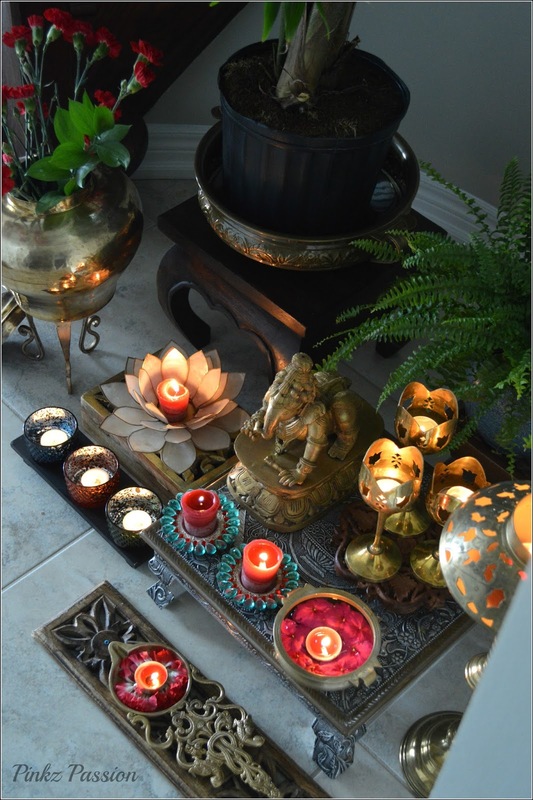 I honestly wish I could decorate for Diwali all year long. Traditional and ethnic decor for Diwali is definitely cultivating my own taste. Limit doesn’t exist in my case when my traditional palette is freshen up with new styles and mantra with the herald of the festivities. All brass route is my way to imbibe and highlight the glitter and glamour of this festive season." Patricia Torres has been one of my first online blogger pals. 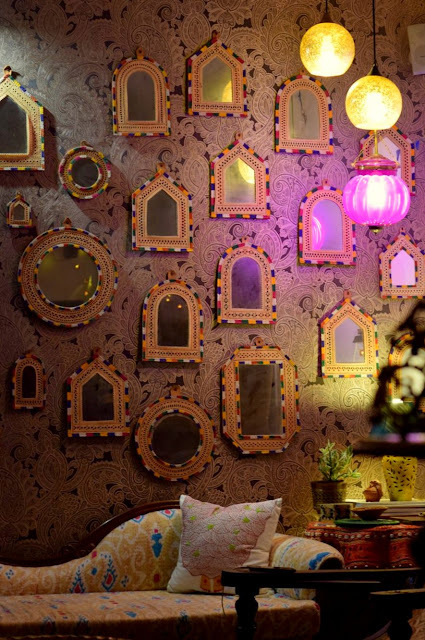 She is passionate about decor and creates the most interesting and pretty vignettes in her home in Dubai! Her blog Colours Dekor is immensely popular and makes for a lovely read. Diwali in her words " Diwali is one of my favorite festivals of the year after Christmas. It also signifies the beginning of the festive season for the year. The lights, the colors & the happiness all around bring positively and joy to everyone’s face. Diwali to me, means the whole family getting together to spend quality time together & enjoy delicious sweets. Even now, all our family & friends will gather at home, or continue to pour in after sunset, to bring in the New year with love, laughter & plenty of food. It truly embodies the sentiment of togetherness. I love preparing for Diwali, cleaning up my home and closets. De-cluttering and giving away bags to the homeless. Ensuring we bring a smile on at least one persons face, by helping them with whatever is required, in some way. My favorite memory of Diwali though is the time I spent with my aunt in Mumbai, when I was a kid. To her it was an auspicious day from early morning baths & dress up, to temple visits, to family lunches, evening prayers & quick family visits. She would also make it a point to visit the nearby orphanage with loads of sweets & gifts, bringing smiles on the faces of the little kids. It would always end with loads of home made sweets & crackers." Thanks Patty, that is a wonderful Diwali memory, one to cherish and to learn from! We are heading back to India to visit Sharon DSouza's home in Pune. Sharon is the founder of the very popular blog TheKeybunch. Her blog combines interesting features related to lifestyle and travel. Her website showcases some lovely India-inspired spaces. For Sharon" Diwali means light and color. Instead of going with the traditional brights this year I brought in color through Millennial Pink, with a hint of green. Since families and friends come together during Diwali, I decided to warm this palette up with traditional brass and fresh flowers. Beauty, grace, color and light are the epitome of this festival for me"
We are heading back to the Pacific Northwest for our last Diwali vignette. Last, but certainly not the least, is my friend and long time advocate and supporter Raji Ram's home:) Raji is a lovely person, she is warm and affectionate and her home reflects her personality! Thank you ladies for sharing your homes with us this Diwali. It means a lot to me! I do hope you all have enjoyed this tour around the world.